The history of courtship is filled with a strange melange of rituals and negotiation designed to appropriately bring two people into the most intimate relationship possible. These steps are especially necessary in cultures that have separated gender roles, because it's the only way that there can be interaction. It's usually not about the individuals, though, and love, if it happens, is usually expected to grow after the two have been married. One example of this is in some Moslem communities in Indonesia. A politician named Hidayat Nurwahid was introduced through a mutual friend to a divorcee, Diana Abbas Thalid, with the hope that the two would make a good match. They met exactly three more times over the next three weeks before announcing their engagement. Diana is quoted as saying "Maybe we'll get to know each other better when we're married." While this seems very strange to contemporary American singles, it's actually one of simplest examples of courting rituals around the world. In many countries, before a couple can begin to consider marriage they have to go through intense economic negotiations between families and more. For example, the first step toward marriage in the Igbo tribes is for a young man to ask his own parents for permission to pursue a woman's hand. This starts off a long series of background checks into her character and her family, as well as negotiating bride-price and other financial considerations. The couple might meet a few times under the close supervision of family members, but as cultural researcher Dr. Basden writes, "The word 'love' according to the European interpretation is not found in the Igbo vocabulary." Not all cultures focus so intensely on the formal aspects of marriage. According to the Chinese Ladies site, courting an Asian can start with the couple going out in public with friends. Behavior is strictly regulated, with no public displays of affection, and this is taken as a sign of respect from the man for the woman. She is expected to play "hard to get" and not show her interest in the man even when they begin going on dates without friends. If he is serious about marriage, warns the site, he must consider himself "...courting the entire family." Many of the courtship rituals from cultures were simply created to let the other person, their family, and the community know of your intention to marry. The ways of doing this have changed over time and can be initiated by both women and men. In Japan and Korea, for example, women are the ones who buy chocolates for the men they're interested in. 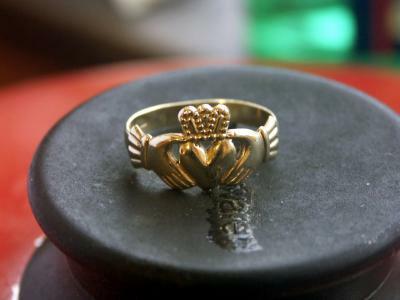 A traditional Irish custom is for single women to wear a claddagh ring with the heart pointing outward to show their availability, turning it around when they become engaged. There are also stories of traditional Norse maidens of marriageable age wearing an empty sheath on their belt. Prospective suitors would put their own knives in to announce their intentions. Sociologist Daniel Cere has noted that courting traditions all over the world are being replaced by the practice of dating. At the same time, Jennifer Wright of the Frisky is one of many women who question the materialism and objectification that seems to be implicit in courting customs ranging from engagement rings to who pays for dinner. On the other hand, some conservative groups hope for a return of the rituals, and books like The Rules set out the new guidelines that many women expect from their suitors. Regardless of the controversy, in the end it comes down to two people finding ways to show how much they want to make a commitment to each other. The best courtship ritual is the one that ends in a successful and happy marriage.